“Amazing Acrobats of Shanghai” - when it comes to excitement, this Branson show sets the standard! You’ll see acrobatic feats so phenomenal; you won’t believe your eyes! This show assembles a troupe of China’s finest and most elegant athletes, trained to perform acrobatic stunts that require an amazing array of skills; strength, energy, endurance, grace, and flexibility, as well as the reflexes of a boxer and the ability to move like a dancer. And everything around these incredible performers helps to highlight their remarkable talent; the stunning costumes, the beautiful backdrops, and even the entire theater, custom-designed for the acrobats, from the stage to the sound to the lighting, it provides the perfect showcase. The striking colors, the exotic glamour, and the unbelievable skill of each spellbinding feat make the “Amazing Acrobats of Shanghai” an ideal, family-friendly show! And, to keep it fresh and new, performers and acrobatic stunts can change from year to year. There’s so much to see on one stage, and there’s so much to say about these acrobats, you simply have to see it to appreciate the magnitude of talent in this production. 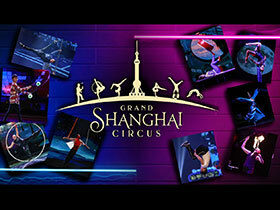 No Branson itinerary is complete without the “Amazing Acrobats of Shanghai!” Contact Branson.com today for more info.